One should not be anxious to offer direct service to the Lord. Sri Caitanya Mahaprabhu advised that one become a servant of the servant of the servant of the Lord (gopi-bhartuh pada-kamalayor dasa-dasanudasah). This is the process for approaching the Supreme Lord. The first service should be rendered to the spiritual master so that by his mercy one can approach the Supreme Personality of Godhead to render service. 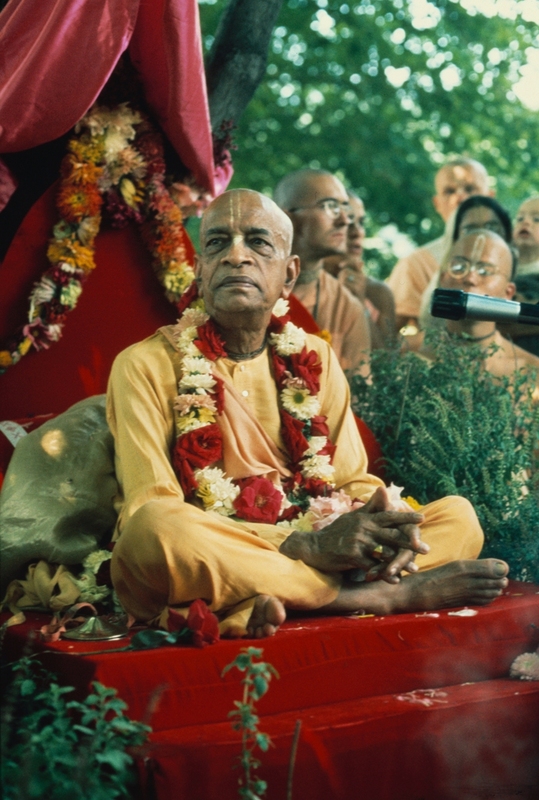 While teaching Rupa Gosvami, Sri Caitanya Mahaprabhu said, guru-krsna-prasade paya bhakti-lata-bija: one can achieve the seed of devotional service by the mercy of the guru, the spiritual master, and then by the mercy of Krishna. This is the secret of success. First one should try to please the spiritual master, and then one should attempt to please the Supreme Personality of Godhead. Visvanatha Cakravarti Thakura also says, yasya prasadad bhagavat-prasado. One should not attempt to please the Supreme Personality of Godhead by concoction. One must first be prepared to serve the spiritual master, and when one is qualified he is automatically offered the platform of direct service to the Lord. Therefore Prahlada Maharaja proposed that he engage in the service of Narada Muni. He never proposed that he engage directly in the service of the Lord. This is the right conclusion. Therefore he said, so 'haḿ kathaḿ nu vissrje tava bhṛtya-sevam: "How can I give up the service of my spiritual master, who has favored me in such a way that I am now able to see You face to face?" Prahlada Maharaja prayed to the Lord that he might continue to engage in the service of his spiritual master, Narada Muni.